When you think of motorsports in Indianapolis, you probably think of the Indy 500 and NASCAR, maybe even Formula 1 and the Moto GP, but did you know that the oldest and arguably most anticipated National Hot Rod Association (NHRA) event of the year is this weekend at O’Reilly Raceway Park at Indianapolis? Say hello to the Mac Tools U.S. Nationals presented by Lucas Oil, the granddaddy of all NHRA events. I had the opportunity to attend a Media Luncheon yesterday that featured five high-profile NHRA drivers to promote the Mac Tools US Nationals event, scheduled to start at O’Reilly Raceway Park at Indianapolis today. Robert Hight (Funny Car) – Hight is a two time Mac Tools U.S. Nationals winner, including 2008. He currently sits 12th in points, but is only 15 points from a berth into the Countdown to the Championship. 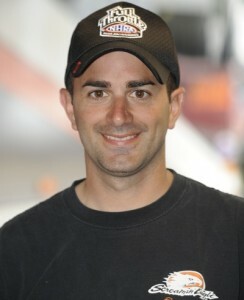 Eddie Krawiec (Pro Stock Motorcycle) – Krawiec earned his first Full Throttle Series world championship in 2008 and became only the second driver since 1979 to win a championship without winning a race. Kraweic is once again in contention for a world championship in 2009. Morgan Lucas (Top Fuel) – Raced to semifinals finishes at Pomona 1, Chicao and Richmond in 2008. Lucas has 19 career final rounds, six in Top Fuel and 13 in Top Alcohol Dragster. Currently sits seventh in the Countdown to Championship points. John Force (Funny Car) – Earned his first win since the season-ending crash in Dallas in 2007 that left him with multiple serious injuries. As team owner, Force has a 22-year streak of seasons with at least one win. Force has four Mac Tools U.S. Nationals presented by Lucas Oil wins. The schedule is jam packed with six days of activities, including four days of racing. While prices for admission vary depending on where you sit and which events are going on each day, Kids 12 and under are free for General Admission (not including reserved seating). As I was preparing to write this post, I came across this great video that Fox 59’s Jeremiah Johnson put together about the upcoming event. NHRA events are very different than the events at the Indianapolis Motor Speedway and it was great to get an insight into another sport where the center of it’s universe is Indianapolis. If you’re interested in attending the Mac Tools U.S. Nationals presented by Lucas Oil, check out their schedule and prices for their weekend-long event. If you attend the Mac Tools U.S. Nationals presented by Lucas Oil, be sure to come back to the Indiana Insider blog and let us know what you thought!